Efficient "personal shredders" for data protection within reach. Particularly easy to use, with large bin capacity for fine strips or small cross-cut particles. Compact construction and user friendly. 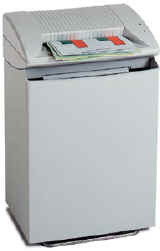 Designed for continuous use unlike other personal shredders. Fully automatic - Reverse switch in case of paper jam - Catch basket with opening for general paper waste - Solid steel cutter, accepts paper clips and staples - Emptying the catch basket is easy. Designed for convenient under the desk placement.